International Association Of Independent Journalists Inc. :: View topic - Photos and Video of the WSIS+10 Citizen Journalism Session! 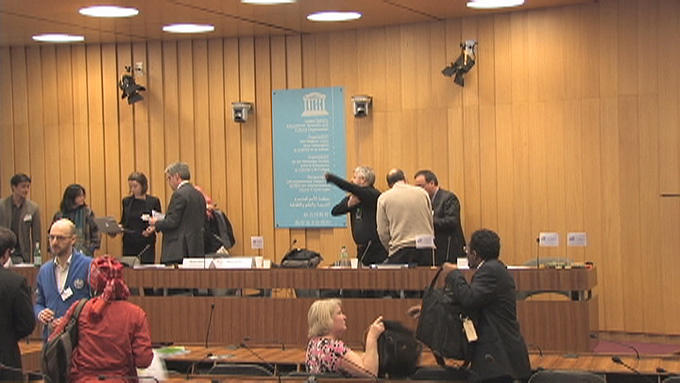 Photos and Video of the WSIS+10 Citizen Journalism Session! Posted: Tue Mar 12, 2013 8:13 pm Post subject: Photos and Video of the WSIS+10 Citizen Journalism Session! 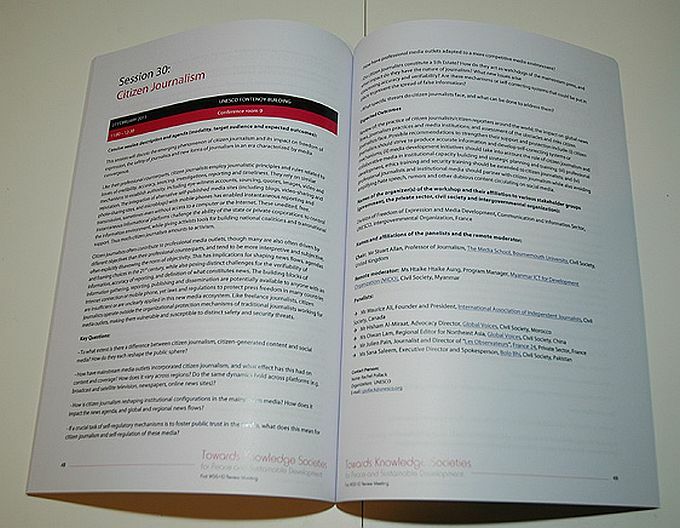 Print material available for delegates! 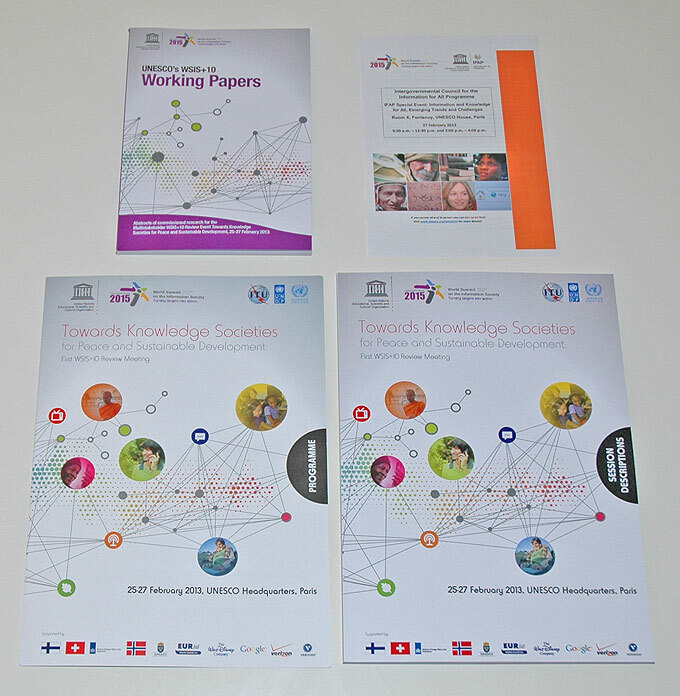 WSIS Booklet describing the session! Above is a video still from the start of the Citizen Journalist Session at the WSIS+10 Review Meeting held in Paris, France on February 25-27, 2013. That is the start of the session with me panicking while setting up all the video cameras and getting my speech ready to lay on an unsuspecting audience. At the front is Sue, an IAIJ Director, who was with a DSLR camera also shooting video. That camcorder providing video and stills was in the back hiked up over everyone's head except for the first row. We actually had a good crowd, much to my surprise. The link above is from the conclusion and recommendations part of my speech. Realize that for the past nine minutes I had been droning on about all the survey data including that last section of safety/security, all to support the recommendations. So while I rattled through the conclusions and recommendations, the early part of the speech justified the recommendations in hard data. After opening statements was an answer segment where members in the audience and possibly on-line could ask questions of the panelists. Below is some closeup video of me defending the charge of citizen journalists into the realm of traditional broadcast media (Quicktime file but will also play on Windows media). There are more images and video but this gives you an idea of what it was like. 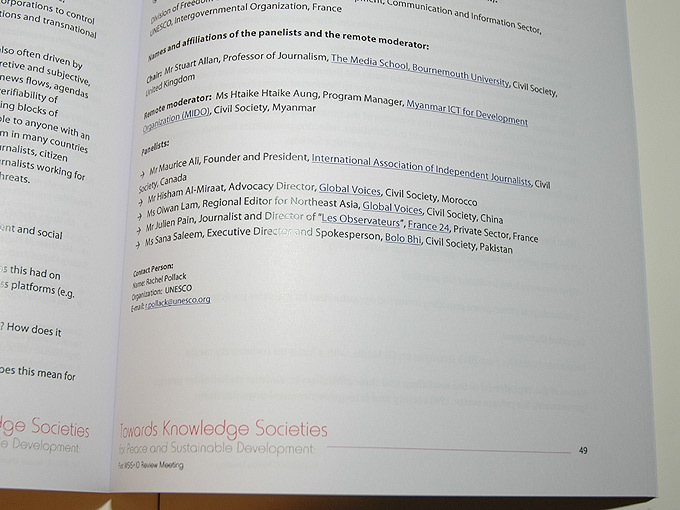 For us at IAIJ it was the early contact with UNESCO and the research and analysis of the report. Publishing of the report and the report being published in The Fortress, and then ready to be discussed at the WSIS Review Meeting with recommendations made for use at the event. What happens from here on is really out of our hands. But it is important to understand that we took this very seriously at all times. We can only take responsibility for our actions and the resultant outcomes directly form our contribution. So what happens in the future may go well or end badly, but our conduct has been first-rate. 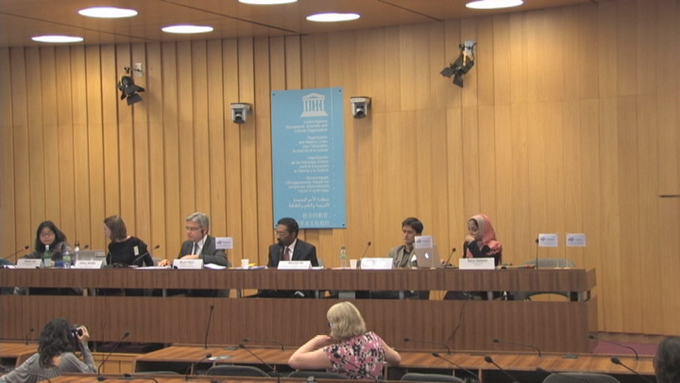 Thanks to all who made the citizen journalist session a success at UNESCO. And thanks to all who participated in the report and helped in the association for making all this possible. We could not have done it without you!